I redeemed some Sephora points a few months ago for this custom-blended serum set because I was on the hunt for a hyaluronic acid, or a hydrating serum. This point perk was 500 points, which was kind of a lot looking back at it. But I've heard great things about Skin Inc. and decided to order the trio. This specific sample kit is no longer available, but you can find the full size version here. 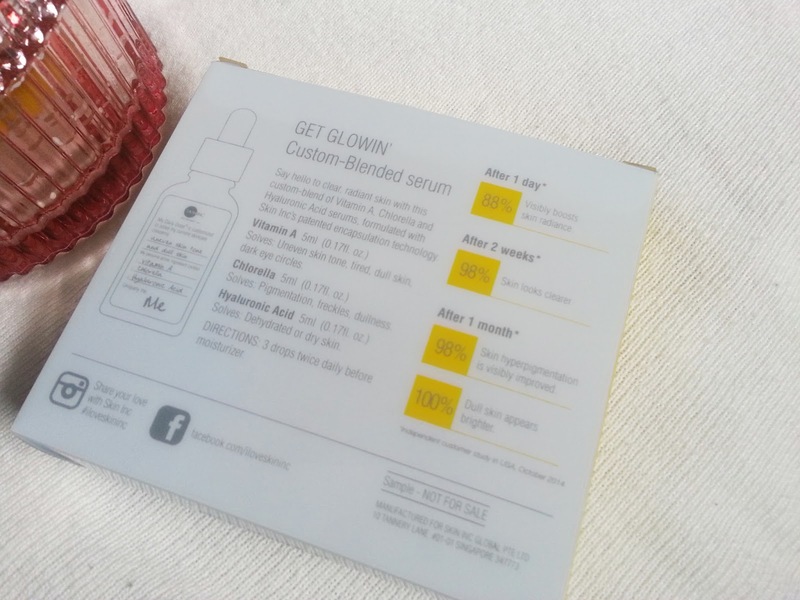 Keep on reading to see what I thought about this custom-blended serum set! As you can see in this trio, you get 3 sample sized serums. 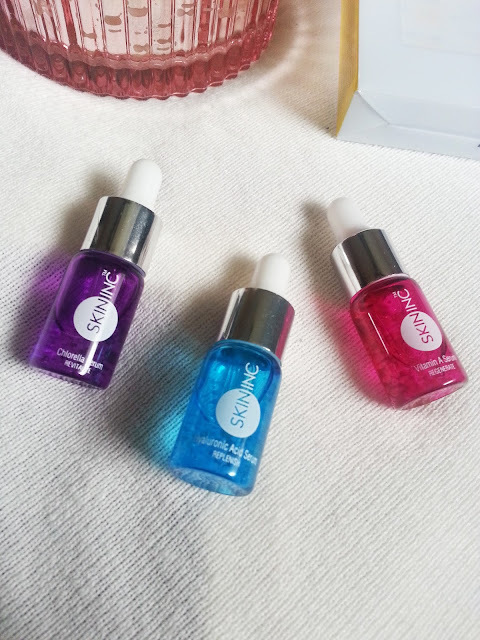 Each serum type comes in it's own coloured vial, making it easier to determine what serum you are using. Each vial is 5mL. I thought they were super tiny, but they did end up lasting me quite awhile, about 2 months or so. The only thing that is different in the full size version (besides the size of the bottles) is that you also receive an empty full size serum bottle, so you can mix the separate serums together easier. Say hello to clear, radiant skin with this custom-blend of Vitamin A, Chlorella and Hyaluronic Acid serums, formulated with Skin Inc's patented encapsulation technology. 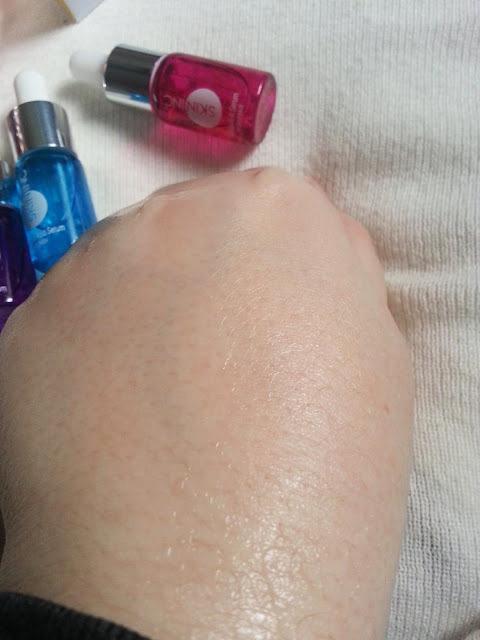 Each serum has little tiny beads inside. As you apply it to your face, they do dissolve. Overall, I really enjoyed the ability to "custom-blend" my own serum. 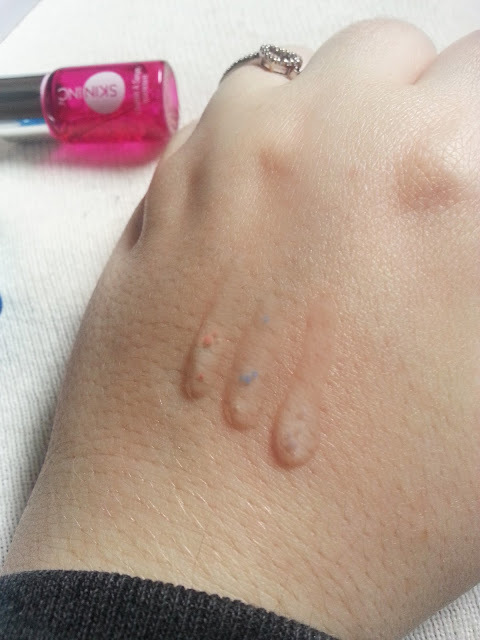 However, I can't say that I saw as much improvement in my skin like their study suggests. I did find that my skin looked clearer around the 2 week mark, but, with that, I started to get dry patches on my skin. I don't know which specific serum of the three caused that issue, but I had dry patches form on my forehead, above my lip, and under both of my eyes. This wasn't an immediate reaction either, this was around the second or third week of continuously using these three serums together. It took about a week of using the Wild Rose Beauty Balm to finally get those stubborn patches to go away. I wouldn't repurchase the full size version, I feel I could get a better outcome from mixing serums from other companies, that really target specific areas, or purchase an already combined serum. I did really enjoy being able to try these out in a sample size though. Thank you so much for posting this! Was thinking about spending the points for the set. This was helpful! It's nice to try as a point perk, but I wouldn't repurchase as full size! It dried out my skin, but everybody reacts differently to skincare!